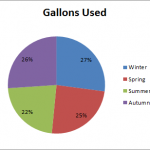 Dave's Reflections » Blog Archive » Going Green Means More Green Going? With my main questions answered I did spend a little time playing with the data. After all, exploring data is fun. For the moment I’ll stick with the more mundane reporting. I’ve loaded the data into Rapid Miner and Weka to do some mining, which I’ll write about later. I split the data in seasons, since I’ve noted an obvious pattern in MPG changing through the year. 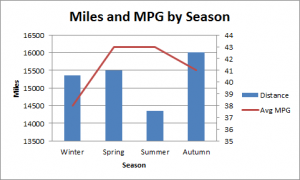 I then reported on miles driven and MPG in each season. To keep the reporting balanced I only used the three complete years of data that I have (it’ll be another 7 months to fill out another complete set of seasons). 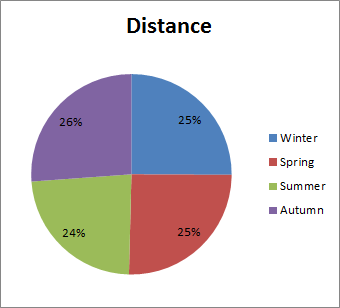 Looking at the charts it is interesting to see the differences in total driving distance by season. 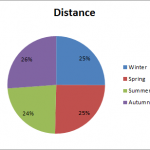 I wasn’t expected to see that, or if anything differed, I expected winter to involve fewer miles driven than other seasons. As I’d observed informally, the average MPG clearly changes during winter. I think increased Ethanol added by fuel companies during cold months is the likely culprit. Interesting that gas prices don’t reflect that lowered efficiency during the winter. 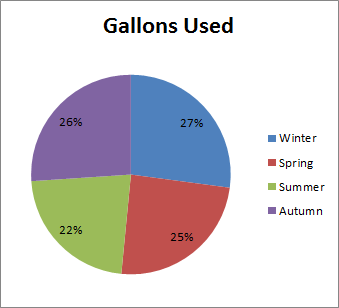 All told, even though I do 25% of my driving in the winter, I use 27% of the gas I purchase. Not a huge difference, but certainly not optimal. I should drive less in the winter to maximize my annual savings. As I begin considering the purchase of a new car, I am less sure that a hybrid will be my top choice, especially since many small cars get good mileage, easily within 6 MPG (highway) of a lot of hybrids. If others out there have had a significantly different experience with their hybrid I would be interested in hearing about it. This entry was posted on Thursday, August 11th, 2011 at 01:18	and is filed under Cars. You can follow any responses to this entry through the RSS 2.0 feed. You can skip to the end and leave a response. Pinging is currently not allowed. Jim Manico (twitter:manicode) points out that with the federal tax credit for hybrid vehicles I would be in a more favorable financial position. A valid consideration, but unfortunately when I purchased my hybrid in 2007 the credit had been phased out for the Civic.